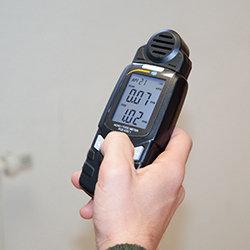 An indoor air quality meter is used in confined spaces to prevent mold, to monitor CO2 levels, or to detect gas leaks. Whether portable or fixed, handheld or wall mounted, air quality monitoring equipment is essential for ensuring health and safety. 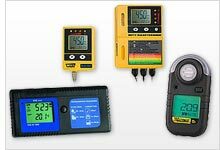 At PCE Instruments, you will find air quality monitoring devices that meet various industry standards relating to personal safety and that are used to detect, measure and monitor relative humidity, ambient temperature and / or levels of carbon dioxide (CO2), volatile organic compounds (VOCs), formaldehyde (HCHO), freon and other refrigerants (CFC / HFC), phosphine (PH3), hydrogen sulphide (H2S), carbon monoxide (CO), nitrogen dioxide (NO2), oxygen (O2), ozone (O3) and other flammable, hazardous or toxic gases. Some air quality meter devices feature an auto-calibration function that allows for easy calibration of the gas detector. Some air quality meters also possess the ability to store measurement values and can later transfer the measurement data to a computer for more detailed analysis. If you have any questions, please contact us at or +44 (0) 2380 987 035 for PCE Instruments UK, or or +1 (561) 320-9162 for PCE Americas Inc.
PCE-RCM 10 is a portable handheld air quality particle counting meter or particle counter used to monitor particulate matter (PM) concentrations in the air. Designed to aid in indoor air quality (IAQ) assessments, this particle counter also measures air temperature and relative humidity (RH). The PCE-HT110 Air Quality Meter or Humidity Detector precisely measures air temperature and relative humidity. This accurate and reliable device shows the current measurements on the large LCD display and saves the measurement data directly to an SD card (included). The PCE-HT110 is equipped with two channels, accommodates an SD card memory of up to 16 GB, offers an adjustable measurement rate / sampling interval, and includes a wall mount, making the device ideal for logging data over an extended period of time. The air quality meter PCE-RCM 15 is specially designed to monitor the quality of indoor air. Among other things, the air quality meter measures the parameters for PM1, PM2.5, PM10, TVOC, formaldehyde, humidity and temperature. PCE-VOC 1 is a portable handheld volatile organic compound (VOC) and formaldehyde (HCHO) meter or gas leak detector for indoor air quality (IAQ) monitoring applications. This easy-to-use VOC meter is ideal for measuring total volatile organic compound (TVOC) and formaldehyde (HCHO) levels in homes, offices, factories, laboratories, hotels, schools and other indoor environments. The air quality meter PCE-RCM 11 serves as an indicative test of environmental parameters. The air quality meter PCE-RCM 11 enables the measurement of fine dust, temperature and relative humidity. The bright display of the air quality meter provides information about the already mentioned parameters. The Air Quality Particle Counting Meter PCE-RCM 12 is used for indicative testing of environmental parameters. The air quality particle counting meter PCE-RCM 12 enables the measurement of CO2, fine dust, temperature and relative humidity. The bright display of the air quality particle counting meter provides information about these parameters. - Humidity measuring range: 0 ... 100% r.H.
PCE-MPC 10 is a portable handheld air quality particle counting meter or particle counter used to monitor particulate matter (PM) concentrations in the air. Designed to aid in indoor air quality (IAQ) assessments, this particle counter also measures air temperature and relative humidity (RH). PCE-WMM 50 is a wall-mounted air quality meter that uses diffusion to monitor carbon dioxide (CO2) gas levels and ambient temperature (ºC / ºF) indoors. This indoor air quality meter features an alarm-activated potential-free contact that can, for example, activate a fan to reduce CO2 gas concentration in the room. PCE-G1 is an indoor air quality meter with a large display. This IP54-rated wall-mountable device measures both relative humidity (%RH) and temperature (°C only). The PCE-G1 air quality meter has a large LED display with a number height of 100 mm, so measurement values can be seen at a distance of up to 50 m away. PCE-G1A is an indoor air quality meter with a large display. This IP54-rated wall-mountable device measures both relative humidity (%RH) and temperature (°C only). The PCE-G1A air quality meter has a large LED display with a number height of 100 mm / 3.9 in, so measurement values can be seen at a distance of up to 50 m / 164 ft away. PCE-PCO 2 is a portable handheld air quality particle counting meter or particle counter used to monitor particulate matter (PM) concentrations in the air. Designed to aid in indoor air quality (IAQ) assessments, this particle counter also measures air temperature, dew point and relative humidity. CDL 210 is an indoor desktop non-dispersive infrared (NDIR) air quality meter with data logger for detecting, measuring and monitoring carbon dioxide (CO2) levels as well as relative humidity (% RH) and ambient temperature (?C / ?F) in home, school, office and industrial work environments. Air Quality Meter Gasman-H2S "Hydrogen Sulfide"
The Air Quality Meter Gasman-H2S is a unique gas meter which protects against a specific gas, inflammable or toxic. The Air Quality Meter warns with a penetrating alarm and an optical signal (useful in case when there are loud noises in the surroundings) of the existence of dangerous gas concentrations and shows on screen the value of the gas measurement. The Air Quality Meter fulfills all the European and international norms, even ATEX and UL standards. Manufacturer: Crowcon Detection Instruments Ltd.
Air Quality Meter Gasman-O2 "Oxygen"
The Air Quality Meter Gasman-O2 is a unique gas meter which protects against a specific gas, inflammable or toxic. The Air Quality Meter warns with a penetrating alarm and an optical signal (useful in case when there are loud noises in the surroundings) of the existence of dangerous gas concentrations and shows on screen the value of the gas measurement. The Air Quality Meter fulfills all the European and international norms, even ATEX and UL standards. Air Quality Meter Gasman-FL "Flammable Gases"
The Air Quality Meter Gasman-FL is a unique gas meter which protects against a specific gas, inflammable or toxic. The Air Quality Meter warns with a penetrating alarm and an optical signal (useful in case when there are loud noises in the surroundings) of the existence of dangerous gas concentrations and shows on screen the value of the gas measurement. The Air Quality Meter fulfills all the European and international norms, even ATEX and UL standards. Air Quality Meter Gasman-SO2 "Sulfur Dioxide"
The Air Quality Meter Gasman-SO2 is a unique gas meter which protects against a specific gas, inflammable or toxic. The Air Quality Meter warns with a penetrating alarm and an optical signal (useful in case when there are loud noises in the surroundings) of the existence of dangerous gas concentrations and shows on screen the value of the gas measurement. The Air Quality Meter fulfills all the European and international norms, even ATEX and UL standards. Air Quality Meter Gasman-NH3 "Ammonia Gas"
The Air Quality Meter Gasman-NH3 is a unique gas meter which protects against a specific gas, inflammable or toxic. The Air Quality Meter warns with a penetrating alarm and an optical signal (useful in case when there are loud noises in the surroundings) of the existence of dangerous gas concentrations and shows on screen the value of the gas measurement. The Air Quality Meter fulfills all the European and international norms, even ATEX and UL standards. Air Quality Meter Gasman-H2 "Hydrogen"
The Air Quality Meter Gasman-H2 is a unique gas meter which protects against a specific gas, inflammable or toxic. The Air Quality Meter warns with a penetrating alarm and an optical signal (useful in case when there are loud noises in the surroundings) of the existence of dangerous gas concentrations and shows on screen the value of the gas measurement. The Air Quality Meter fulfills all the European and international norms, even ATEX and UL standards. Air Quality Meter Gasman-NO2 "Nitrogen Dioxide"
The Air Quality Meter Gasman-NO2 is a unique gas meter which protects against a specific gas, inflammable or toxic. The Air Quality Meter warns with a penetrating alarm and an optical signal (useful in case when there are loud noises in the surroundings) of the existence of dangerous gas concentrations and shows on screen the value of the gas measurement. The Air Quality Meter fulfills all the European and international norms, even ATEX and UL standards. Volatile organic compounds (VOCs) are airborne gaseous or vaporous substances of organic origin. Examples of VOCs include hydrocarbons, alcohols, aldehydes and organic chemicals. Where do VOCs come from? Many detergents, solvents, paints, varnishes, adhesives and other synthetically manufactured substances can produce VOCs. In addition, numerous naturally occurring organic compounds formed by biological processes such as plant metabolism, decay and degradation can create VOCs. How do VOCs get into the air? VOCs can become airborne through evaporation or emission. Evaporation sources can include household cleaning products, construction and building materials, and indoor furnishings, flooring and decor. Emission sources can include traffic exhaust, tobacco and cigarette smoke and industrial pollution. Cigarette smoke particles mainly are distributed in the size range from 0.1 to 1.0 micron. Even food preparation and human metabolism can be sources for airborne VOCs. Less obvious is the proliferation of various impurities not firmly embedded in products. These impurities can be slowly released from the product's surface into the air. This applies, for example, to residual solvents in plastics (monomers), auxiliaries such as plasticizers, solubilizers, antioxidants, stabilizers and catalysts used in the production process, as well as by-products such as fragrances, flame retardants and biocidal agents. VOCs called terpenes can be released from materials of natural origin, like wood. VOCs also can be formed during reactions between oxygen, ozone or water with natural ingredients in wood and vegetable oils. What are the health effects of VOCs? Usually, indoor VOC concentrations are low and present little risk to human health or safety. However, prolonged or excessive exposure to VOCs can lead to adverse health effects including headaches, dizziness, fatigue, nausea, liver and kidney damage, and cancer. Occupants worried about the presence of VOCs in homes, schools and businesses should seek advice from IAQ experts such as industrial hygienists and heating, ventilation and air conditioning (HVAC) professionals. How can indoor VOC concentrations be reduced? Consumers should choose low-emission products and materials. Environmentally friendly labeling such as the Blue Angel is a helpful purchasing aid. Construction materials successfully tested according to the AgBB scheme with a recognized Ecolabel provide assurance that the potential for VOC emissions is minimized. Regular testing, adjusting and balancing (TAB) of HVAC systems should be performed to alleviate VOC concentration through proper ventilation. Should you require assistance in selecting an air quality meter product, please don’t hesitate to contact the PCE technical support staff at or +44 (0) 2380 987 035 for PCE Instruments UK, or at or +1 (561) 320-9162 for PCE Americas Inc.